I've been trying to cut down on unnecessary snacking, which is an awful habit of mine. Lately when the mood strikes I try to grab a cup of tea. 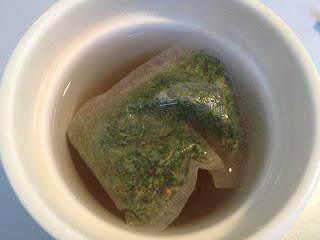 Numi offers a new line of savory teas, which you can see here. I recently picked up a sample, and when the snack bug started biting today I decided to give it a try. My tea bag has spinach and chives in it. It's like having a healthy snack! I really do love the idea of this tea, but does the taste meet my expectations? My sample is spinach chive, and the ingredients are: organic spinach leaves, organic chives, organic dried lime, organic dill, organic onion, decaf green tea, organic coriander, organic turmeric, organic garlic. Hmm, sounds like something I'd eat for lunch, or maybe even drink as a smoothie. I do enjoy a green juice now and again, so this has potential. The dry tea bag has a strong dill and onion scent. It made me smile because the dill brought me back to my childhood sticker book days. I had a 'scratch and sniff' dill pickle sticker that smelled very similar! The directions are steep 10 minutes while covered. That's quite a long time, but I don't like my tea to be too hot so I didn't mind. It also says to squeeze the bag after steeping to maximize flavors. I've heard tea bags are not supposed to be squeezed because it makes the brew bitter. But since there isn't much actual tea in these, it may not be such a faux pas. The tea smells...soupy. The onion and dill are still very strong, and everything stewing together creates a savory aroma. Not surprisingly, it smells like a fragrant vegetable soup. Which is very similar to how it tastes. It is strong on onion, chive, and dill with a green vegetal taste from the spinach enhanced by the green tea. It has a garlicky finish. I do enjoy vegetable juices and smoothies, but the flavor here doesn't quite satisfy. Every time I sip this, I want to add some potatoes and puree it for a oniony soup. It may be interesting to throw a bag in the pot while cooking quinoa or couscous. Instant flavor packet! My main concern after drinking this tea is the lingering onion/garlic breath. This may make it difficult to drink in the office. I think I'd like to try cooking with the liquid instead of drinking it. I still can't get that potato soup/ spniach chive tea out of my head, so I may have to whip some up soon. Oh, I was hoping this would end differently. I've been thinking of increasing my tea consumption to limit my snacking. Hello Sarah! I love drinking tea and this one seems interesting. I haven't tried it before, but I have drunk garlic and dill tea quite often. In fact, my latest tea has been dill tea. I do enjoy it a lot, especially because it brings many health benefits. I suffer from digestive problems, so this tea has helped me cope with the symptoms.